The annual Lenten Tour at Valley Lutheran High School is one of the more popular extracurricular activities and a staple for music students for more than two decades. 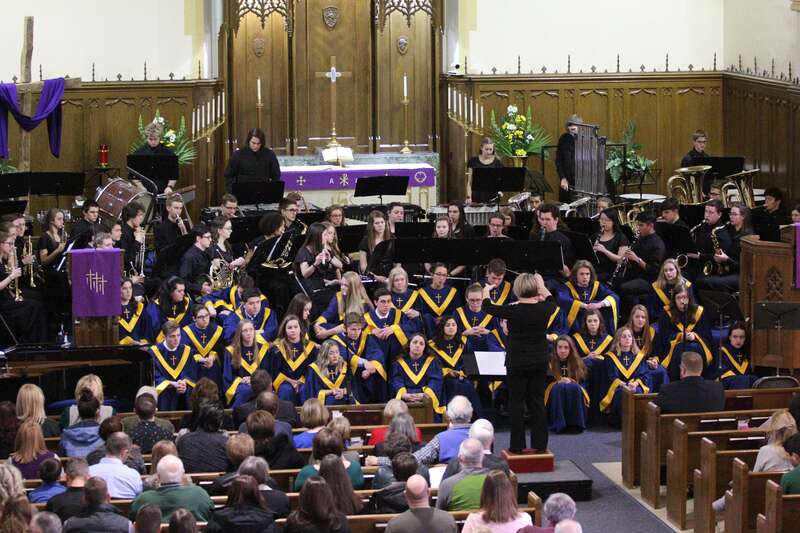 Each spring the Symphonic Band and Golden Voice Choir travel the Midwest performing at churches and schools during Lent. The group of 78 musicians, under the direction of Eschmann and Lindsay Mueller, departed Wednesday, March 13 after performing at Valley for chapel, and they embarked on a five-day, six-concert tour through Ohio and Michigan. Valley Lutheran High School, and its music program, used the opportunity to share Christ’s message and remember the salvation we all enjoy because of the sacrifice He made. The group performed at Immanuel Lutheran in Bridgman, Michigan, Saint John Lutheran in Rochester, Michigan, Bethany Lutheran in Parma, Ohio, and Saint Paul Lutheran in Napoleon, Ohio before capping it off with a home concert at Peace Lutheran Church in Saginaw on Sunday, March 17. In between the performances, the group took the opportunity to stop by a couple attractions such as the Rock’n Roll Hall of Fame and the West Side Market in Cleveland. Peace was also the theme of the performances with the hope of allowing students to use their gifts to impact others. “It gives our students the opportunity to put into practice what they’ve learned all year long, and that’s to use their gifts and talents to share Christ with other people,” Eschmann said. “What makes it special and unique is that they have the opportunity to do that on their own, without any guidance. When they go to host family homes, they engage in conversations with those families about their faith, what they believe, what they plan to do in the future, and how Christ fits into that picture.